I was in the mood for something light for dinner and wanted to make a dressing with buttermilk and mustard. I picked up a roast chicken because I was very pressed for time, but didn’t want to eat a plain roast chicken from the market. I grabbed some beautiful romaine, but I know this would be perfectly awesome with kale, Joel is not big on kale and prefers romaine. Next time I make this I am using chopped kale, preferably baby kale. In any event I used romaine, took the skin off the chicken and shredded it with my hands. 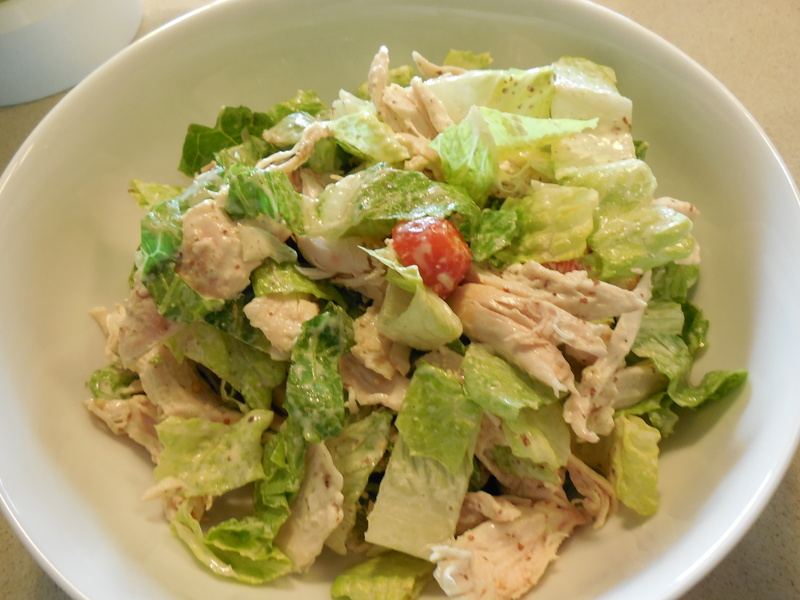 Just used romaine, tomatoes, chicken and dressing. Next time out I add avocado for sure, doubt Joel will eat it but I am putting in avocado. This is an awesome lunchtime salad and so easy to pull together for a light dinner meal and mix in whatever other veggies you’d like. Dressing is killer and only 3 Tablespoons of Buttermilk! This is also awesome if you have leftover chicken and don’t know what to do with it. The inspiration for this salad and dressing comes from a blog I follow, 124 Park. Part of being a part of the blog culture I am exposed to some really wonderful blogs , I just wish I had the time to read all of them. This dressing should be good for at least 4 servings. Feel free to double it. Combine all ingredients except for olive oil in the blender including salt and pepper . Keeping blender on , add olive oil from the top in a slow stream until well incorporated. Put salad greens, avocado , chicken and any other vegetables you’d like in a large bowl. Add dressing and mix salad adding dressing as needed. This entry was posted in chicken, Salad, salad dressing and tagged Buttermilk Salad Dressing, Roast Chicken Salad with Buttermilk Dressing, Weeknight Roast Chicken Salad with Buttermilk dressing, Weeknight Salad with Buttermilk Dressing, What to do with a Roast Chicken, What to do with leftover chicken. Bookmark the permalink. This recipe was originally posted May ’13. 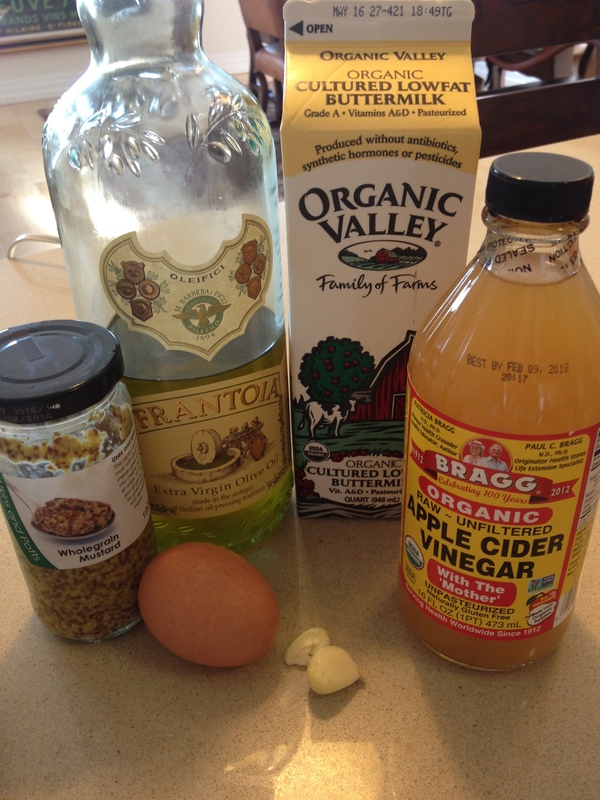 It is an killer salad dressing which I made and have made again and again. It is a true staple in the Kolen household. Sometimes you just need to break out of the Vinaigrette mold. It really is a light dressing if you could just move past the buttermilk part. It is only 3 tablespoons of Buttermilk in the whole dressing. Give it a try the next time you’re looking for a salad dressing. Enjoy!